Printmaking can be a source of fascination and challenge that requires an indirect way of working (Hurwitz & Day, 2001). To create a print is to weave the artist’s experience and perception, insight, and differentiation into one (Neumann, 1974). In order to create a print, something must be done to one substance in order for another to emerge, like an alchemical process, there is a series of steps that must be undertaken that lend themselves to the process to a ritualistic method. These steps also help to create distance from the final outcome, so many times, the self-consciousness of the accuracy of a shape or object to be portrayed is minimized during the process due to the seeming disconnect from the final picture. The details associated with shading, more appropriate to drawing, are not needed in the print-making process, but in the place of this perceived limitation comes the power of strong impact images made through simplification and contrast (Hurwitz & Day, 2001). Many printmaking processes employed in therapy result in reversed images. This reversal may change or distort one’s original composition, intentionally or unintentionally (Dean, 2016a). When one is printing letters and words, reversals can lead to illegibility or a kind of coding. The image is printed in reverse, “so any handwriting has to be done backwards and thus already feels as if one were writing in secret code” [italics original to source] (Nissen, 2008, p. 19). 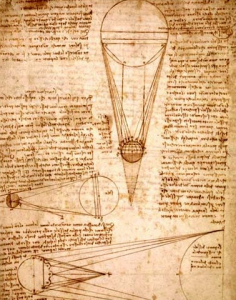 This secret code writing can be seen in many of Leonardo da Vinci’s journals, which was meant to be both a challenging mind exercise and a protective measure to keep his inventions safe from potential theft (Chastel, 1961). Reversed writing in a print can be seen in a mirror, setting the writing into a legible form. Reversal is also considered a defense mechanism; its primary purpose is to defend or hold emotional and cognitive dissonance. The dissonance arises when there are two or more conflicting beliefs and results in exceptional discomfort because there is often no way to reconcile these states of being. For example, in Aesop’s fable The Fox and the Grapes, the fox rejects the grapes after being unsuccessful in obtaining them. 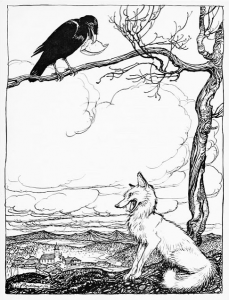 In this retelling of the tale, one can see how the rejection of the unobtainable is illustrated (Dean, 2016b). A fox, feeling very hungry, made his way to the vineyard, where he knew he would find a hearty bounty of grapes. In the vineyard, the glistening grapes cascaded in the sun and made him all the more hungry. It is easy to disregard, strongly dislike, or hate what one is unable to obtain, which is both the moral of this story and the protective function of the psychological process of reversal. The reversal expresses the opposite of what is desired, calling the grapes too sour even though they were very much desired. Jung stated, “There can be no doubt, either, that realization of the opposite hidden in the unconscious—the process of “reversal”—signifies reunion with the unconscious laws of our being, and the purpose of the reunion is attainment of conscious life or, expressed in Chinese terms, the realization of the Tao” (CW 13:30). Tao is considered the path or way of life and signifies the fundamental nature of the universe and its primordial essence. It is a part of traditional Chinese philosophy and religion and is a way of creating harmony with one’s will or nature, coming into being or enlightenment or experiencing an aliveness. This aliveness can also be experienced as the tension that is created in the printmaking process. 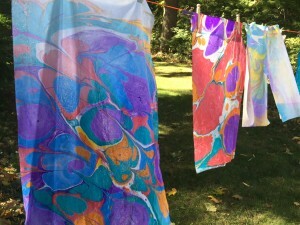 By engaging in art making, such as one of the many forms of printmaking in a therapeutic context with a qualified art therapist, one can benefit from psychological insight into some of the many underlying processes that manifest in daily life because life is a creative process and art reflects life. Chastel, A. (1961). The genius of Leonardo da Vinci: Leonardo da Vinci on art and the artist. New York, NY: The Orion Press. Dean, M. L. (2016a). 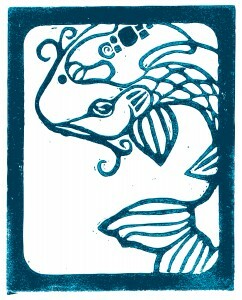 Printmaking: Reflective and Receptive Impressions in the Therapeutic Process. In D. Gussak & M. Rosal [Eds.]. The Wiley Handbook of Art Therapy. Hoboken, NJ: Wiley-Blackwell. 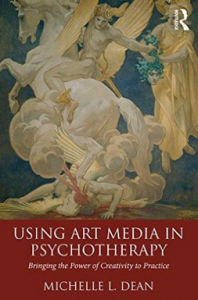 Dean, M. L. (2016b).Using Art Media in Psychotherapy: Bringing the Power of Creativity to Practice. New York: Routledge. Hurwitz, A. & Day, M. (2001). Children and their art: Methods for the elementary school. Fort Worth, TX: Harcourt College Publishers. Jung, C. G. (1967). Alchemical studies (R. F. C. Hull, Trans.). In H. Read et al. (Series Eds. ), The collected works of C.G. Jung (Vol. 13, 2nd ed.). Princeton, NJ: Princeton University Press (Original work published 1957). Neumann, E. (1974). Art and the creative unconscious: Four essays. Bollingen Series LXI. Translated from the German by Ralph Manheim. Princeton, NJ: Princeton University Press. Nissen, D. (2008). Stalking the feral artist: A series of monoprints in which the artist has an unforeseen encounter with Habuman. Jung Journal: Culture & Psyche, 2, 4, 17–33.